Native Dancer is the big star of this 134th running of the Kentucky Derby. He isn't running, having died in 1967. In fact Native Dancer did not win the Kentucky Derby. 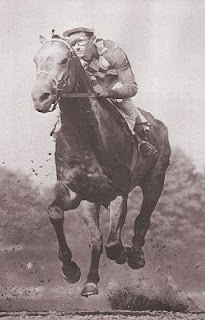 In 1953, the gray colt would go on to win the Preakness and the Belmont, but lost by a head to Dark Star in the Kentucky Derby, having been fouled twice early, and making a furious late charge to take second place. His blood, however, flows through every colt running today. Not a bad legacy, is it? "...several generations of deliberate breeding have made Native Dancer's DNA the most valuable commodity in racing. The last 13 Kentucky Derby winners have been descendants, as was the last triple crown winner, Affirmed. The world's best current racehorse, Curlin, is a relative, as is Cigar, the sport's all-time money leader. Breeders say his bloodline can now be found in about 75% of all U.S. thoroughbreds. No other racing family comes close." But this is part of the sport. Much like the Motion Picture industry, or the Television industry, when people discover something that works they stick with it. 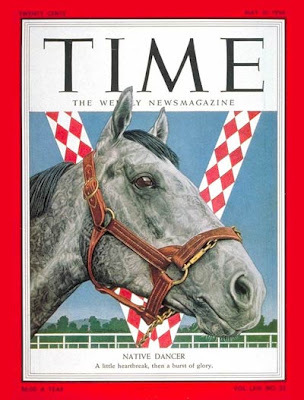 Native Dancer was a winner, his offspring have been winners, so the breeders continue to try to reinforce the bloodline to create another winner, and perhaps another Triple Crown winner like Affirmed. Will they do it before the leg problems make further offspring unable to compete? Who knows? But until another big winner goes to stud and produces successful offspring, I'd bet the breeders will still try to use the bloodline of Native Dancer to make some fast horses. I enjoy the Triple Crown races, but I rarely watch any other horse racing events. My experience with the Triple Crown began in 1973, the year of the great Secretariat. Big Red won me the princely sum of $12 in the Kentucky Derby and I cheered for him in every race after that. I managed to pull his number out of a hat at a barbecue party on Derby day. It cost me a dollar, which I consider well-spent. Secretariat remains my favorite Thoroughbred horse of all time. Watching him run was something incredible. A big horse, like a big man, may have a long stride that chews up the yards, but without that extra something, he will not win a race. He also needs exceptional speed and endurance. And Secretariat had that. 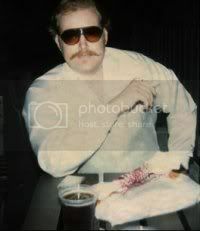 He also seemed to have a touch of whimsy, much like that of the legendary Sea Biscuit. 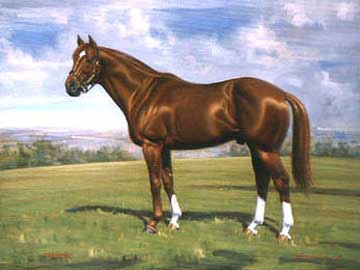 It was said of Sea Biscuit that he liked to run alongside his leading competition. Liked to look them in the eye. And then he would simply pull away and leave that contender dis-heartened that he had nothing left while Sea Biscuit was still pulling away. According to those who knew Secretariat when he was still racing, the big, chestnut horse seemed to know which were the big races, and which weren't. And he would only give it his all for those big races. And, friend, it showed! He was big enough to fend off other horses fouling him. And once in the lead he was not going to be caught. In the Derby of 1973, Secretariat was last out of the gate and finally caught up with the leader, Sham, in the back-stretch and pulled ahead. He set a still standing track record and won by 2 1/2 lengths. His times for each quarter of the race were successively faster, meaning he was still accelerating as he crossed the finish line! Incredible! 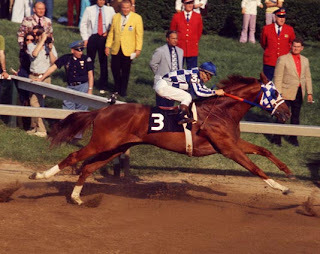 In the following Preakness Stakes Secretariat again came out of the gates last, but had taken the lead by the first turn! His time, due to foul-ups with the official track clock, remains in some question, but he is considered to be among the record holders for the race time. Again, he won the race by 2 1/2 lengths. His jockey swore Secretariat had not broken a sweat in the race. By the Belmont Stakes Secretariat was the overwhelming favorite. And he must have had an inkling that he was on the verge of immortality. Only four other horse were even entered. Sham, having taken second again at the Preakness, was there for the Belmont. Secretariat would go on to run the fastest mile-and-a-half on dirt ever. He won, going away, by 31 lengths. He may as well have run alone. Secretariat finished in 2:24 flat. And no other horse has ever gone faster than 2:25 for that distance. 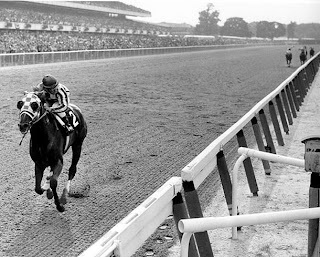 Secretariat was possibly the fastest horse to ever run the Triple Crown races. And he had become the first to win the Crown in 25 years. 5,617 winning mutuel tickets from this race were never redeemed. Some souvenirs, no doubt. That shows the excitement Secretariat engendered. Secretariat raced after the Triple Crown win, and was impressive in some of them, winning the inaugural Marlboro Cup in a then-world record of 1:45 2/5 for 1 1/8 miles, setting a track record at the Woodward Stakes - on grass - then finishing his racing career in the Canadian International Stakes with a 6 1/2-length win . His record of 16 wins in 21 races is not the best record by a long stretch, but he finished in the money in 20 of those races. 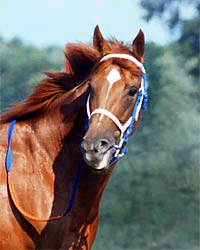 Secretariat, put out to stud, seemed to enjoy visitors, and he would pose when people pulled out their cameras. A smart, fast, beautiful horse, Secretariat was put down in 1989 after coming down with laminitis, an often-incurable and painful condition of the hooves. He has never been equaled. Any wonder I cheered for him? He is one of the reasons the Triple Crown races are so popular, so exciting, so successful. Could we be about to see the birth of another Secretariat or Native Dancer today? Only time will tell! Update: Big Brown, with only 3 races under his saddle, won going away, in 2:01 4/5. He took the lead going around the final turn and just led the way from there. A very convincing win! Wow! Eight Belles, the filly, was injured following the race. She battled back to finish second. I can see her laying down on the track. I'll let you know what happened. Eight Belles suffered two broken legs - the front legs - collapsed after the race, and never got up. Her jockey must have known what happened - he walked away after he got up. Eight Belles was euthanized at the spot where she fell. Very sad. A pretty filly who ran a wonderful race. Horse pr0n, awesome. Ever seen the behind the scenes at the Derby? It is just like the infield at a NASCAR event. Publish a feed, please, sir. I do most of my blog reading on my phone. Do it for the good of the country, by that, I mean me. Does Atom count? I'm not sure exactly how to do that. The fooferaw at the racetrack is amazing. But I watch to see the horses run. I'm still a bit shaken by the death of the filly. Gad, what a sad way to end a race! Wonderful post, Benning. I wish I had read it before the race. Eight Belles amazing second place was so exciting only to be followed by her death - left me washed out. Truly a day of both triumph and tragedy. I liked your post. By the way, we have a t-bred out of the Native Dancer line. Gorgeous. 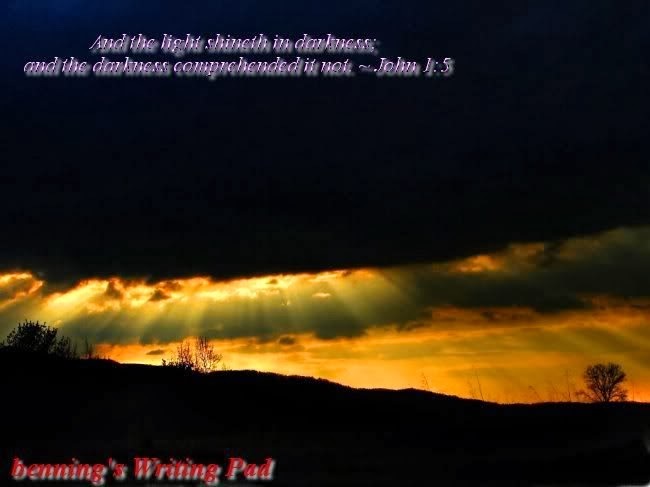 Thank you for coming to my blog and reading my post about The Derby. I enjoyed reading your account as well. Perhaps one day horses won't be hurt on the track. Great bit of history, Benning! An Obama Thursday: Is He Serious?